Pak i spændingen på denne La Fortuna tour på Adventure Park. 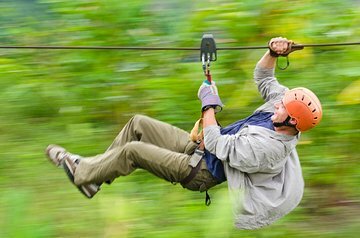 Kombiner en zipline baldakintur - komplet med flyplader og hængende broer - med en rørtur, vandretur og varme kilder til det bedste af La Fortuna regnskov eventyr på en dag. Tour inkluderer alle aktiviteter og adgangsgebyrer samt hotel afhentning og drop-off. Since we had not ziplined before we were very anxious, but Miguel, Jefferson, Arturo, Tiger and the others made us feel very safe and comfortable. The activity was fun and we appreciated the extra attention they gave my daughter and her grandmother who were apprehensive to do the activities alone. The tour guides were kind and funny making the whole experience a great time! The people definitely make Costa Rica an amazing place to visit! !